Bruce's background is different than you may expect from an artist. 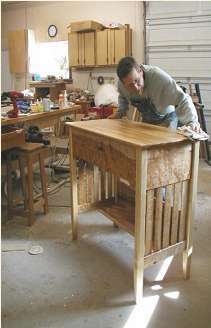 For over 25 years he has been building custom furniture and working as a professional forester. Bruce explains his recent direction as being consumed by painting with wood. He states, "It was an 'ahha' moment when all my experiences, skills and my view of the world became focused into my works. It seems strange but my experiences as a forester, firefighter, furniture maker, outdoors man and avid scuba diver flow seamlessly into my art work. Everywhere I look I get new ideas for a piece, sometimes it's the wood itself and sometime it's as simple as the ripples in a pond or the way the light reflects off the river. I'm profoundly influenced by the beauty of the natural world around me and my experiences in it. Living in western Montana every day is an inspiration. Whether it is an epiphany or early senility I really don't know but I'm committed to exploring my new visions in wood." The techniques that Bruce uses in his latest artistic endeavors use traditional marquetry, veneering and woodworking skills. He has also developed his own unique uses of aniline dyes, which are used to saturate the wood veneers with color. Bruce explains, "The aniline colors are used to dye the wood prior to assembly. The colors are actually soaked into the wood fibers not just painted on to the surface. From the dyed woods and natural woods the piece is precision cut then assembled and pressed into place using special veneer glues and a vacuum press. The vacuum press creates pressure close to 1 ton per square foot which is critical in flattening and getting the proper adhesion. My work is not only creating the piece but also a fair degree of assembly. I view my art work as very liberating in the creation process and very exacting in the execution. I like the idea of creating a unique piece using wood in unusual ways and using my developed skills as a craftsman to put it all together." Bruce Shinn continues to design and build unique custom furniture for the discriminating home owner, business person and art collector. His furniture, hand crafted in his shop in a rural area of western Montana under the shade of majestic mountain peaks, is collected and enjoyed by customers from the Pacific to the Atlantic. With designs that are inspired by nature, art, music and the wood's individual character, Bruce crafts unequaled pieces that show off the natural color, texture and beauty of wood in interesting and unique forms. Bruce designs and builds his unique furniture creations under a rather broad interpretation of contemporary. He attributes his style to an appreciation of many styles of furniture and derives inspiration from the works of some of the masters of the modern furniture movement, such as Maloof, Krenov, Nakashima, Frid, Stockdale, Osgood, Carpenter and many others. "I will always be a student of design and will continue to learn new techniques in my desire to create beautiful pieces in wood. The warmth and beauty of the wood itself inspires me to experiment in new and interesting ways to show off this natural beauty." Bruce does not limit himself in the techniques he uses to create his furniture, implementing traditional hand tools, modern machinery and his own innovations to create his wood art. "My goal is always the same: to create a quality, artistic product using quality materials and the finest craftsmanship to assure a lifetime (and more) of use and enjoyment. In our mass production, throw away world, producing a quality, artistic product is something that is important to my customers and to me." Bruce was selected as a featured artist in the Montana Arts Invitational at the Hockaday Arts Center in Kalispell, MT. He has been showing and selling his art at regional juried shows, such as Sun Valley Arts Festival, Bellevue Art Museum's Northwest Arts Festival and others. Bruce and his art furniture were featured on HGTV's "Modern Masters" in February 2002. Selling his work through fine art galleries, regional shows, the internet, and customer referrals, Bruce continues seeking opportunities to display and sell his artistic creations. "Furniture has become a cheap commodity, mass produced for a world of sameness. I feel it is important, as an artist, to listen to my heart and design from the soul. I am driven to explore, design and create unique pieces in wood."